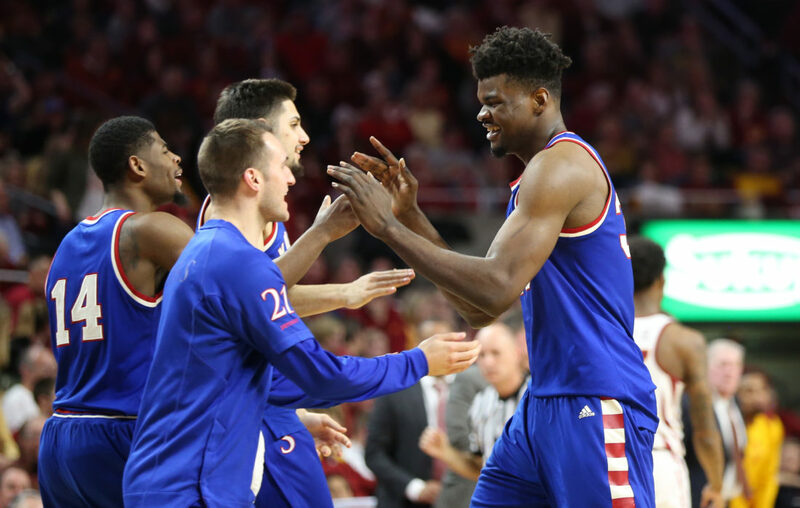 View a gallery of images from Tuesday night’s game between the Jayhawks and Cyclones at Hilton Coliseum. 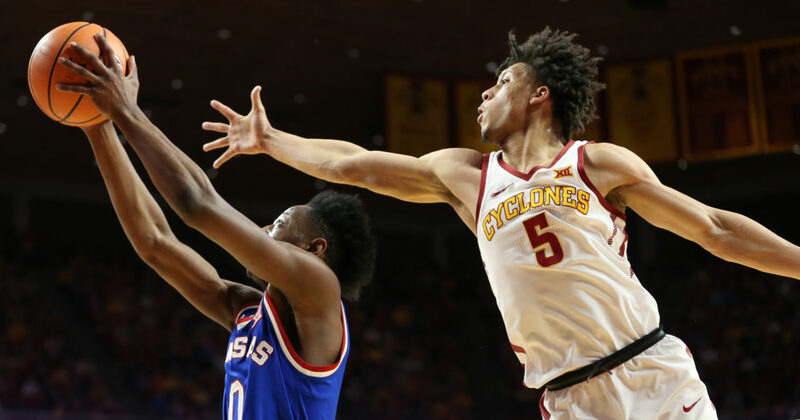 Kansas guard Marcus Garrett (0) extends to the bucket as Iowa State guard Lindell Wigginton (5) hovers over during the first half, Tuesday, Feb. 13, 2018 at Hilton Coliseum in Ames, Iowa. 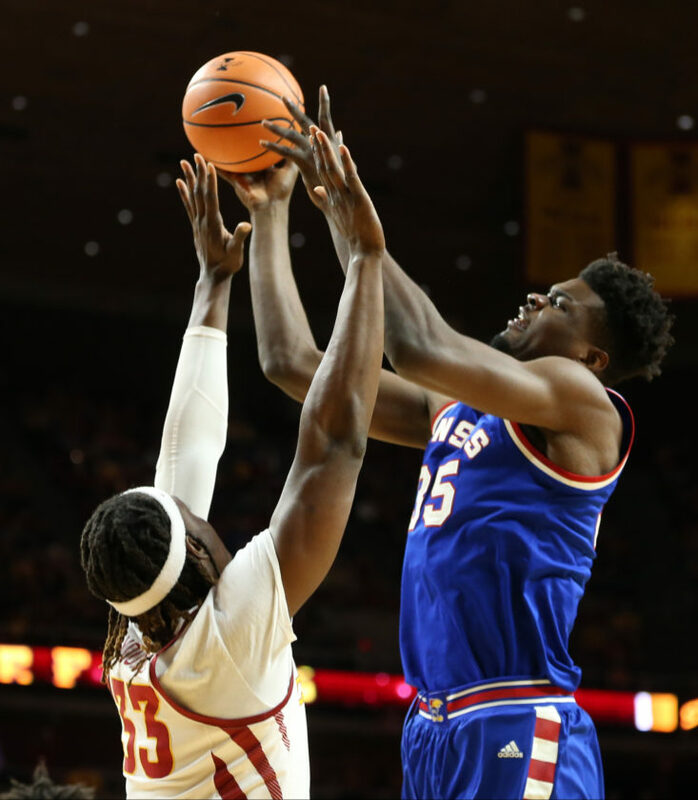 Kansas center Udoka Azubuike (35) turns for a shot over Iowa State forward Solomon Young (33) during the first half, Tuesday, Feb. 13, 2018 at Hilton Coliseum in Ames, Iowa. 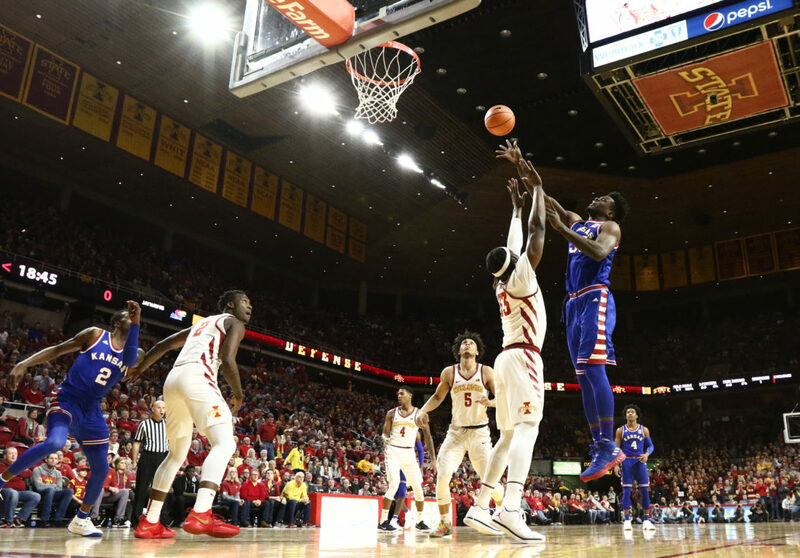 Kansas center Udoka Azubuike (35) puts a shot over Iowa State forward Solomon Young (33) during the first half, Tuesday, Feb. 13, 2018 at Hilton Coliseum in Ames, Iowa. 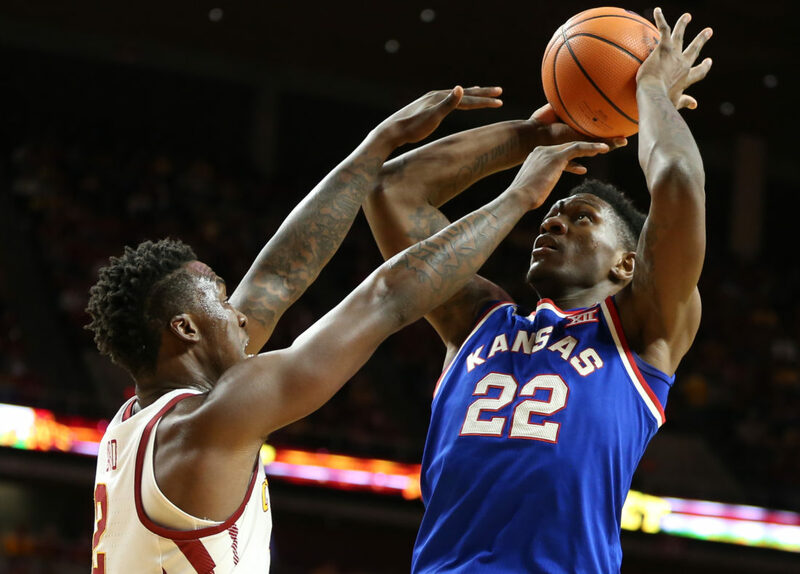 Kansas forward Silvio De Sousa (22) puts up a shot against Iowa State forward Cameron Lard (2) during the first half, Tuesday, Feb. 13, 2018 at Hilton Coliseum in Ames, Iowa. 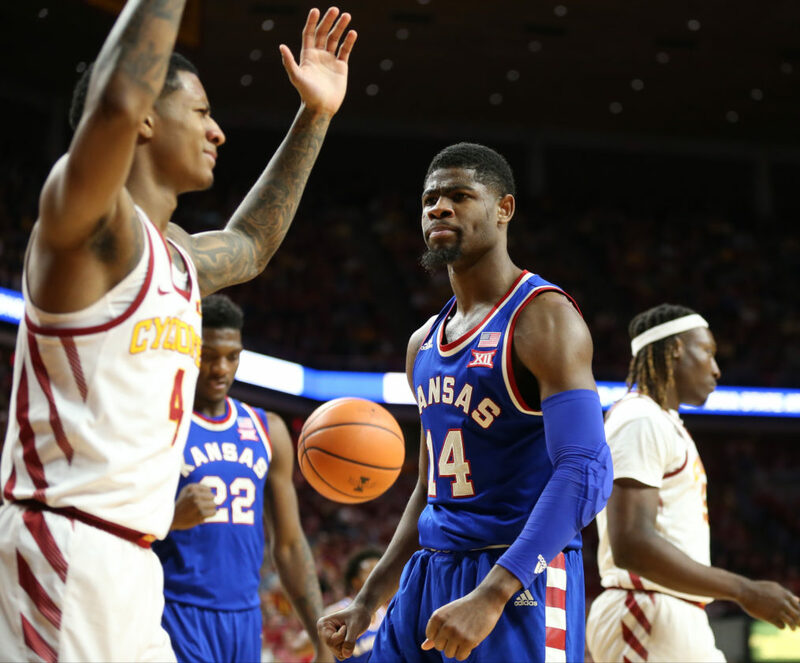 Kansas guard Malik Newman (14) gives a stare to Iowa State guard Donovan Jackson (4) after a bucket and a foul during the first half, Tuesday, Feb. 13, 2018 at Hilton Coliseum in Ames, Iowa. 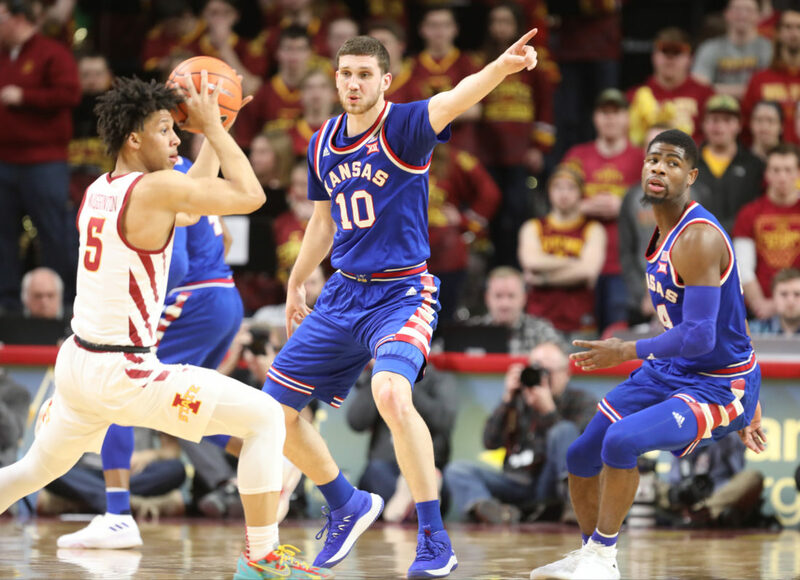 Kansas guard Sviatoslav Mykhailiuk (10) directs his teammates on defense as he guards Iowa State guard Lindell Wigginton (5) during the first half, Tuesday, Feb. 13, 2018 at Hilton Coliseum in Ames, Iowa. At right is Kansas guard Malik Newman (14). 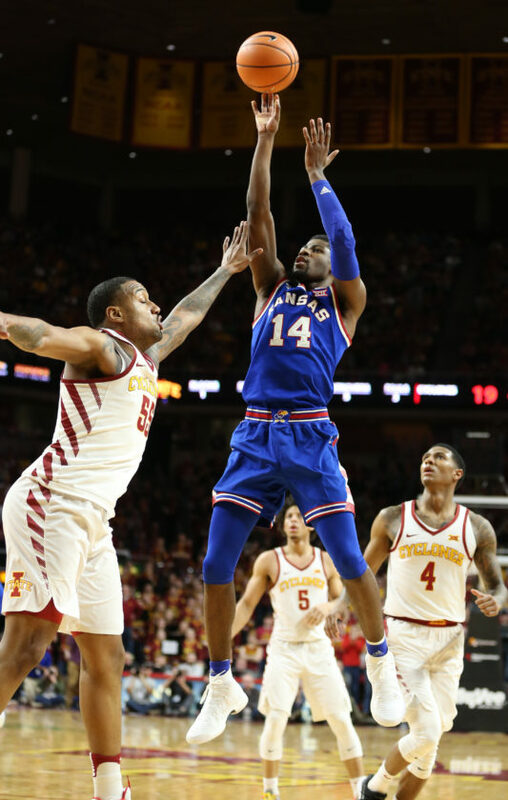 Kansas guard Malik Newman (14) puts up a shot after a foul from Iowa State guard Donovan Jackson (4) during the first half, Tuesday, Feb. 13, 2018 at Hilton Coliseum in Ames, Iowa. 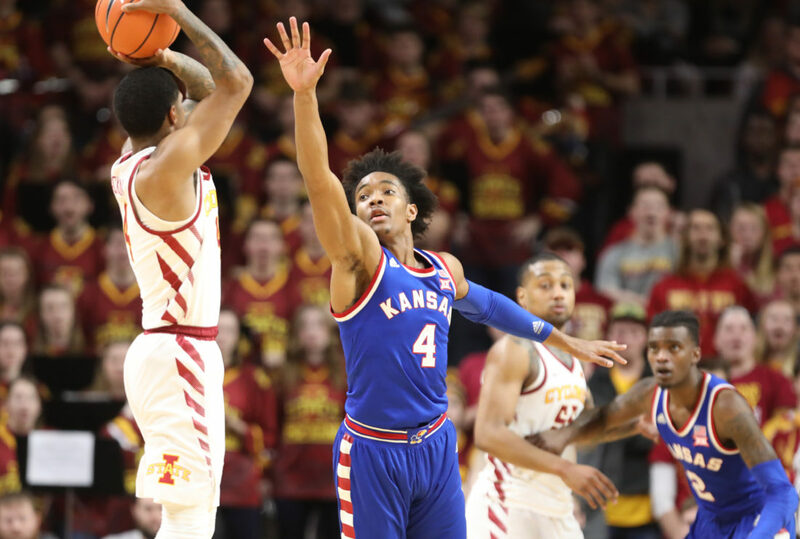 Kansas guard Devonte' Graham (4) defends against a shot from Iowa State guard Donovan Jackson (4) during the first half, Tuesday, Feb. 13, 2018 at Hilton Coliseum in Ames, Iowa. 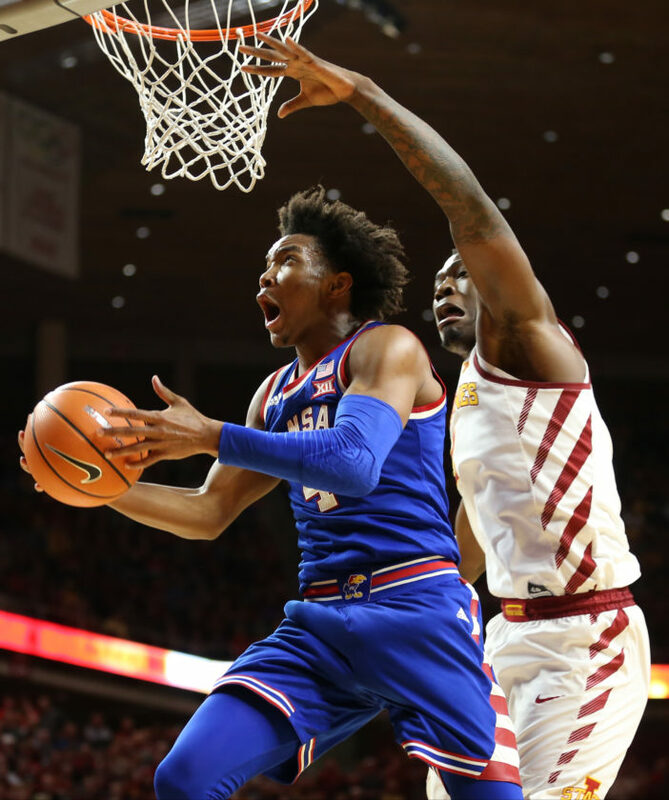 Kansas guard Devonte' Graham (4) is stuffed at the bucket by Iowa State guard Lindell Wigginton (5) during the first half, Tuesday, Feb. 13, 2018 at Hilton Coliseum in Ames, Iowa. 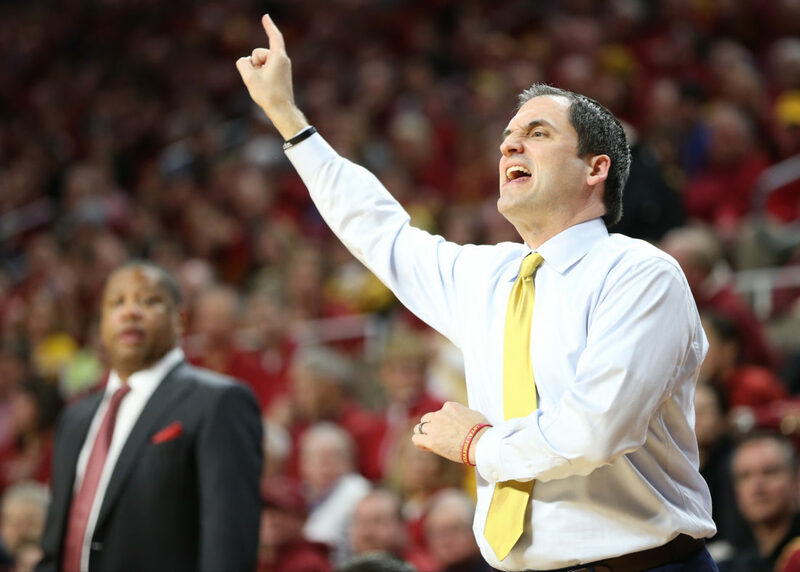 Iowa State head coach Steve Prohm gets the attention of his defense during the first half, Tuesday, Feb. 13, 2018 at Hilton Coliseum in Ames, Iowa. 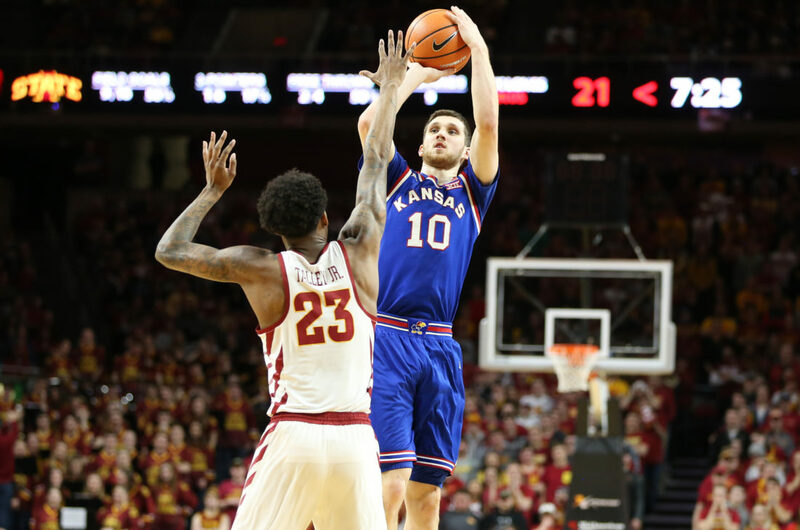 Kansas guard Sviatoslav Mykhailiuk (10) pulls up for a three in front of Iowa State forward Zoran Talley Jr. (23) during the first half, Tuesday, Feb. 13, 2018 at Hilton Coliseum in Ames, Iowa. 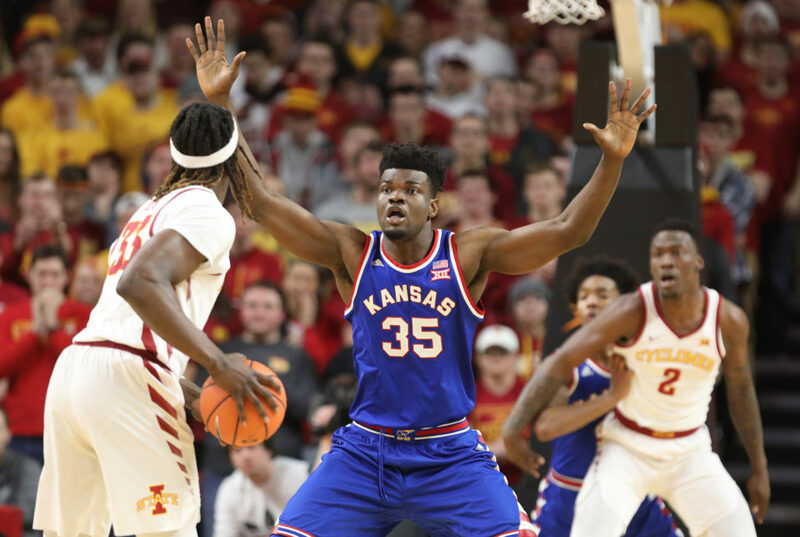 Kansas center Udoka Azubuike (35) looks to stop a pass from Iowa State forward Solomon Young (33) during the first half, Tuesday, Feb. 13, 2018 at Hilton Coliseum in Ames, Iowa. 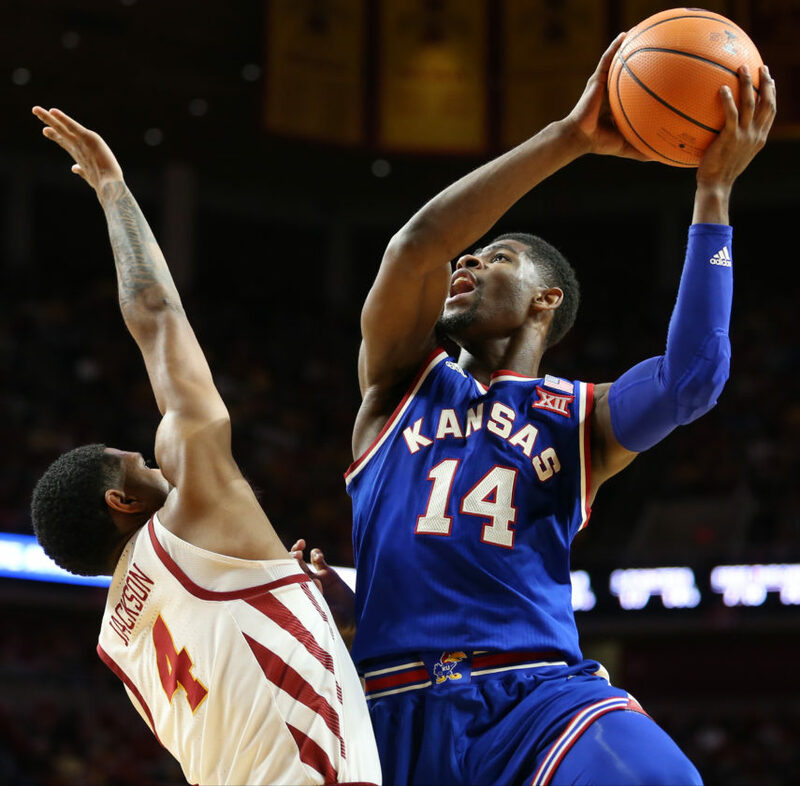 Kansas guard Malik Newman (14) pulls up for a shot against Iowa State forward Jeff Beverly (55) during the first half, Tuesday, Feb. 13, 2018 at Hilton Coliseum in Ames, Iowa. 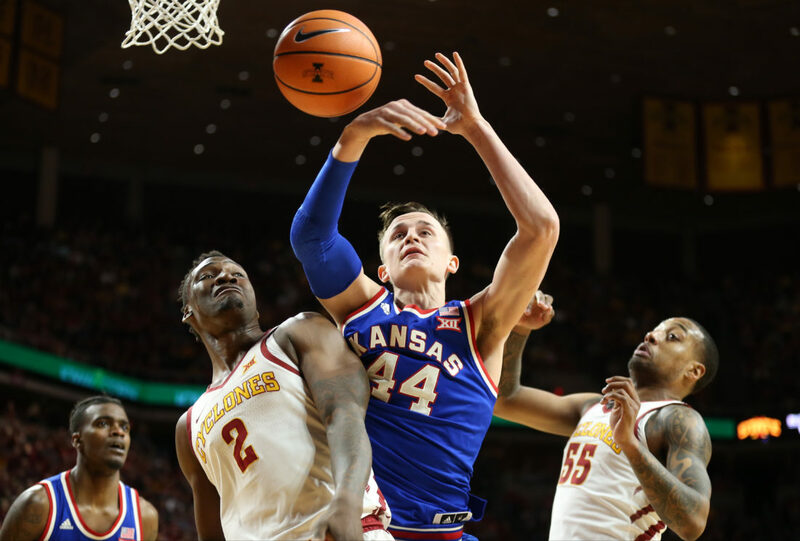 Kansas forward Mitch Lightfoot (44) and Iowa State forward Cameron Lard (2) compete for a rebound during the first half, Tuesday, Feb. 13, 2018 at Hilton Coliseum in Ames, Iowa. At right is Iowa State forward Jeff Beverly (55). 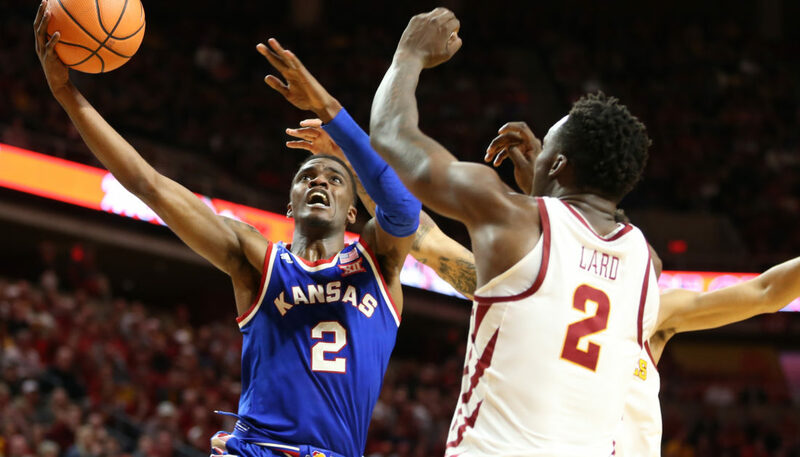 At left is Kansas guard Lagerald Vick. 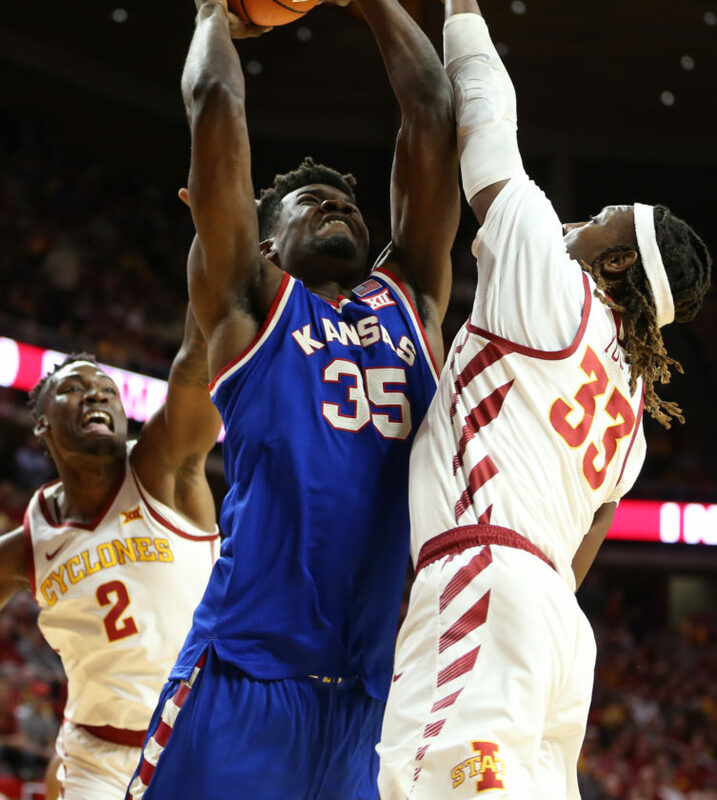 Kansas center Udoka Azubuike (35) puts a shot over Iowa State forward Solomon Young (33) during the second half, Tuesday, Feb. 13, 2018 at Hilton Coliseum in Ames, Iowa. 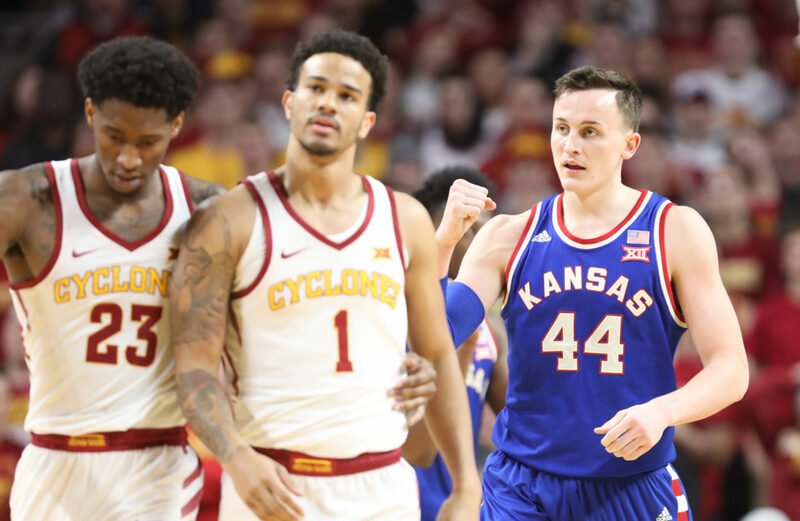 Kansas forward Mitch Lightfoot (44) pumps his fist after an Iowa State foul during the first half, Tuesday, Feb. 13, 2018 at Hilton Coliseum in Ames, Iowa. In front are Iowa State forward Zoran Talley Jr. (23) and Iowa State guard Nick Weiler-Babb (1). 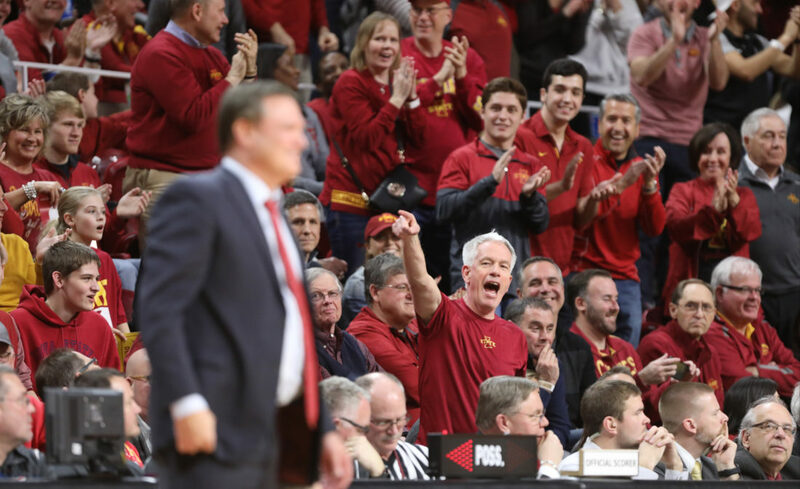 Iowa State fans yell at Kansas head coach Bill Self to sit down during the second half, Tuesday, Feb. 13, 2018 at Hilton Coliseum in Ames, Iowa. 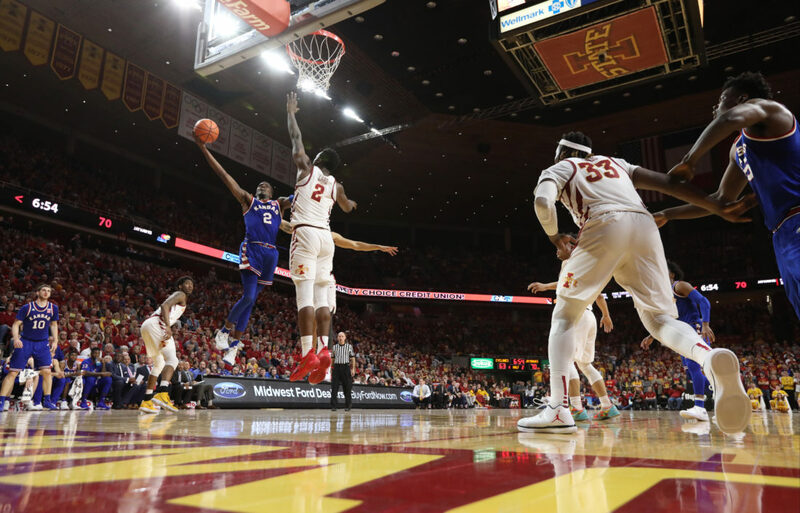 Kansas guard Lagerald Vick (2) swoops in for a bucket against Iowa State forward Cameron Lard (2) during the second half, Tuesday, Feb. 13, 2018 at Hilton Coliseum in Ames, Iowa. 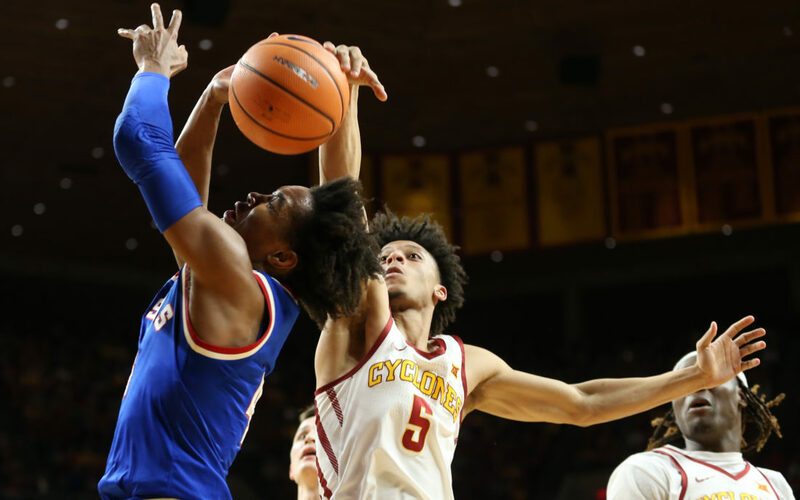 Kansas guard Devonte' Graham (4) gets under Iowa State forward Cameron Lard (2) for a shot during the second half, Tuesday, Feb. 13, 2018 at Hilton Coliseum in Ames, Iowa. 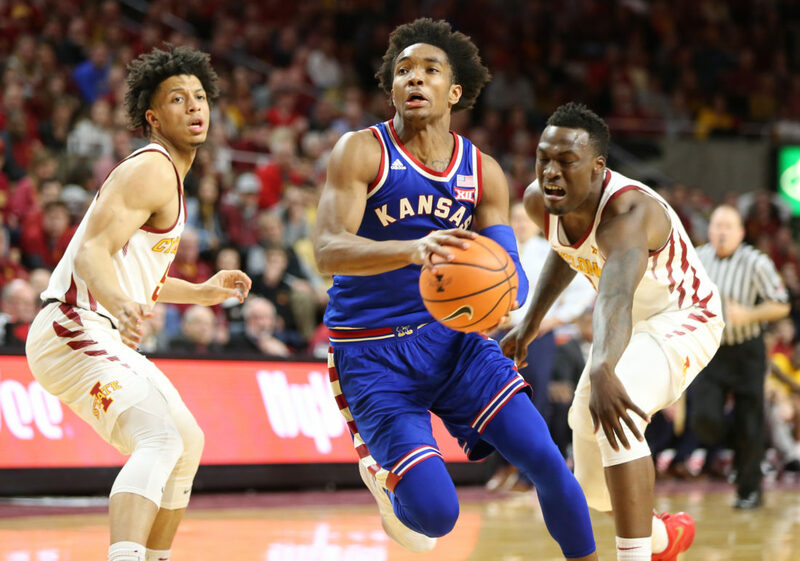 Kansas guard Devonte' Graham (4) gets past Iowa State guard Lindell Wigginton (5) and Iowa State forward Cameron Lard (2) during the second half, Tuesday, Feb. 13, 2018 at Hilton Coliseum in Ames, Iowa. 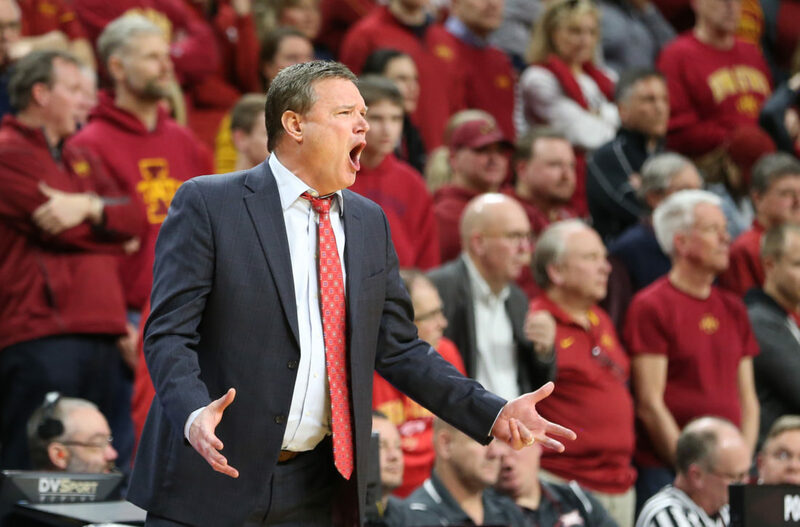 Kansas head coach Bill Self gets the attention of his players with less than a minute to play, Tuesday, Feb. 13, 2018 at Hilton Coliseum in Ames, Iowa. 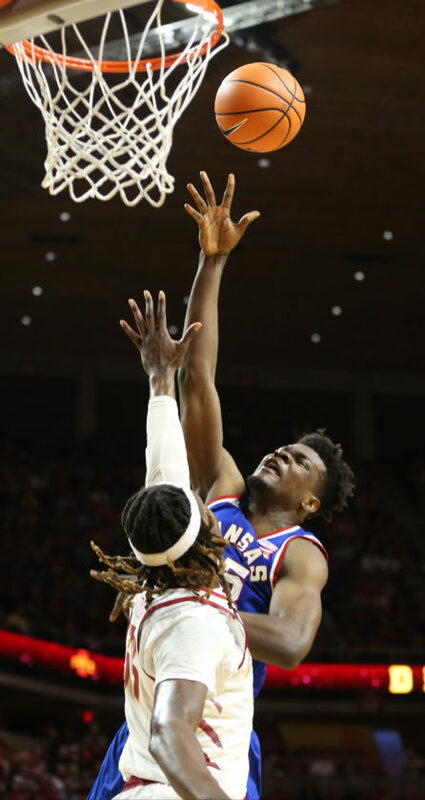 Kansas center Udoka Azubuike (35) comes in to finish a lob jam during the second half, Tuesday, Feb. 13, 2018 at Hilton Coliseum in Ames, Iowa. 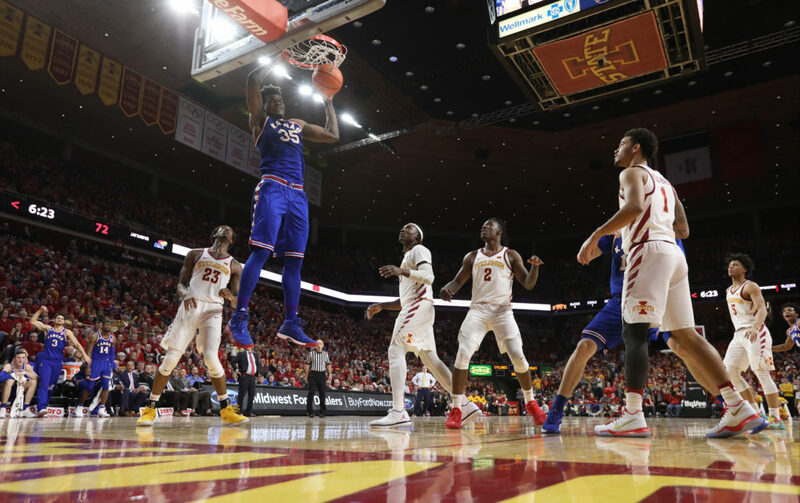 Kansas guard Lagerald Vick (2) gets to the bucket against Iowa State forward Cameron Lard (2) during the second half, Tuesday, Feb. 13, 2018 at Hilton Coliseum in Ames, Iowa. 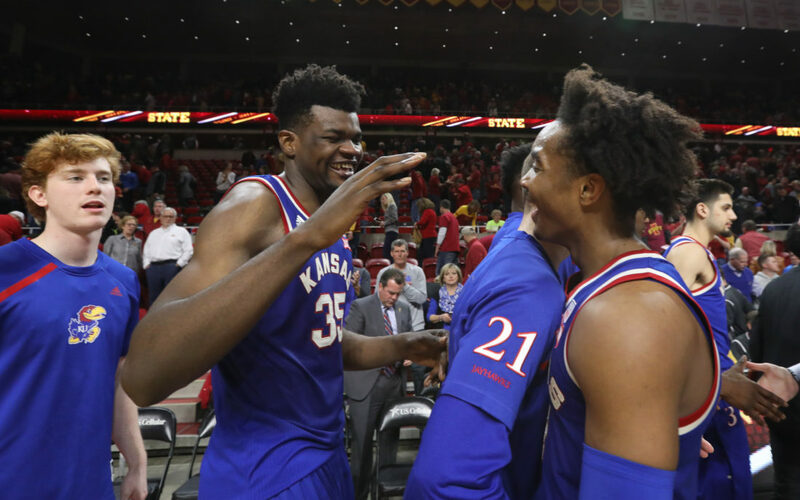 Kansas center Udoka Azubuike, right, is congratulated by his teammates after a string of buckets during the second half, Tuesday, Feb. 13, 2018 at Hilton Coliseum in Ames, Iowa. 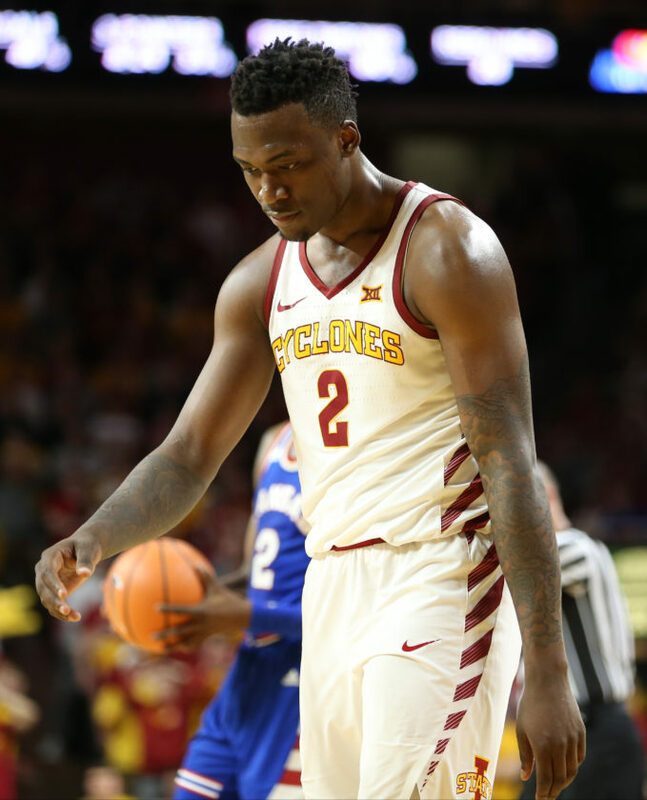 Iowa State forward Cameron Lard (2) shows his frustration after a foul late in the second half, Tuesday, Feb. 13, 2018 at Hilton Coliseum in Ames, Iowa.